I think we all know how much fun a laser pointer can be, but just picture how much fun it would be if you had a device that could make many laser points all at once. I can only assume this was the idea behind creating the BlissLights Laser Wand. This uses what the company calls a “high diffraction efficiency digital holographic optical element”, which creates a shining starfield effect on any wall. Just think of it as a disco ball without the mirror ball or need of reflected light. At first I wondered what to do with device, but these pictures to the left gave me some ideas. It certainly would liven up any party for younger people. As the ad says, you can “spin it, twist it, shake it” which makes it something like a kaleidoscope that everyone can see. Not only will this entertain the young in the dark, but it might be entertaining for adults in the dark as well. I’m not going to go into any detail on that, just use your imagination for that one. 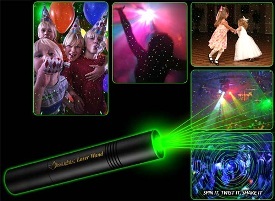 As for power, the BlissLights Laser Wand uses a CR2 battery for about 1,000 hours of usage. The price might be too expensive for peoples’ tastes at about $99.95.